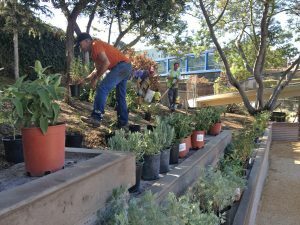 Neighbors plant the Mini-Park before Court opens. The Court has been built!! The MUNA Park Committee is working on a project to add an Activity court to the Fallen Bridge Mini-Park (18th & Utah). The Miller Company has drawn plans with the help of the park committee. Fallen Bridge Activity Court is FUNDED!! 2013 Project!! 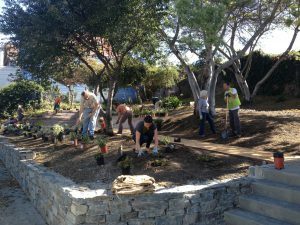 We have been awarded $30,000 from the Community Challenge Grant program and $2,000 from the SF Parks Alliance action grant and $7,000 from D10 Supervisor. Adding this to the $2,000 the neighborhood raised with a White Elephant sale, we have just about raised the $43,875 budget for the park. We will be working with the Miller Company to create the Activity Court. Now all we need is help with the rotten retaining walls, installed in 1970 that keep the park from sliding into the sidewalk!